Spoiler alert: there's a new bakery in town, and it's perfect for us #allergykids. Before all my allergies popped up (if you're unfamiliar with my story, check out this post!) I used to love bakeries. It was always the best treat when my mom would bring my siblings and I to a local bakery one day "just because". I loved indulging in pastries every now and then, but let's face it, who doesn't?! But when my allergies began to pop up, suddenly, going to bakeries was no longer an option for me. Due to my gluten-free/vegan lifestyle, traditional glutenous bakeries don't necessarily cut it for me. I can no longer pop into any random bakeshop and grab a treat, or order a birthday cake from the neighborhood grocery store. Instead, I rely on specialty shops for everything from sandwich bread to salad croutons and yes, even for birthday cake. While this ordinarily would be super difficult, I'm lucky to live in the Bay Area, where specialty shops are fairly abundant. Mariposa Bakery has been my favorite since the day I moved out here, and I've grown to love other independent companies such as Bread Srsly, Oiseau Foods (formerly GreaseBox), and so many others. But while there are so many options, the ratio of glutenous-to-gluten-free bakeries still remains completely imbalanced, so whenever a new bakery pops into town, there's always talk about it in my household. So when I heard that Wholesome Bakery - the newest allergy-friendly bakery- was opening its doors in SF, I knew I needed to check it out. And when Wholesome's team reached out to me a few days later about swinging by to check out their new space, I jumped on the opportunity. Any chance I have to eat cake without tummy troubles is a chance I'll take without question. I brought my mom with me, who was equally-as-excited to come along, and we drove down to The City on a rainy Thursday afternoon. Being that it was so cold and gross outside, having been greeted with warm tea and a thick slice of cake was the best thing ever. Wholesome's team let us pick out a few items to try and, after much deliberation, we decided on a 7-layer bar, a dulce de leche cupcake, and a slice of apple cardamom cake. All vegan, all gluten-free, and all delicious. Of all the treats we tried, the cake was by far my favorite. Maybe because I absolutely love anything to do with apple (apple pie, apple cake, apple pastries, etc.) but either way, it was delicious. While it doesn't quite mimic a glutenous cake (I've yet to find any gluten-free cake that does) I thought it was great, and totally satisfying for someone like me who doesn't normally get to eat cake. The apples were sweet and crisp, and the cardamom gave a nice, chai-like spice that the Indian in me appreciated. The flavor was strong enough that it stood out on its own, but not overpowering in the slightest, in that it didn't totally kill my taste buds with an overload of sweetness, which I appreciated. I don't have a huge sweet tooth, so overly-sweet desserts are not my favorite. The strong yet subtle balance of flavors was absolutely perfect. However, with that said, would I recommend this cake to my gluten-eating friends? Probably not, to be completely honest. The texture was a little too grainy and crumbly, and for those used to eating "normal" cake, it would probably be a bit off-putting. But for someone who lives a specialized lifestyle like myself, again, I think it's a great treat, and was totally satisfying. 10/10 would go for this cake again. The next item we tried was the dulce de leche cupcake, which was one my mom picked out. I'm not a huge cupcake person (fun fact: I hate frosting) so I only ate a bite or two. But, even with not being a huge cupcake person,I still thought it was good! Was it the best cupcake I've ever eaten in my life? No, but was it still yummy? Totally. It was sweet, but not overly sweet, and the frosting wasn't super heavy or sugary, which I appreciated, since again, I'm not a frosting kinda gal. ;) But had I had more of an affinity for cupcakes, frosting, and all things sweet and sugary, I'm sure I would have enjoyed this bite-sized cake a lot more. Also, shoutout to my mom for being my hand-model for the day. Believe me when I say that it's a lot harder than it looks, and I probably spent a solid five minutes placing her palm in the "perfect" position. What can I say, it's the price you pay for hopping along on blog business with me. 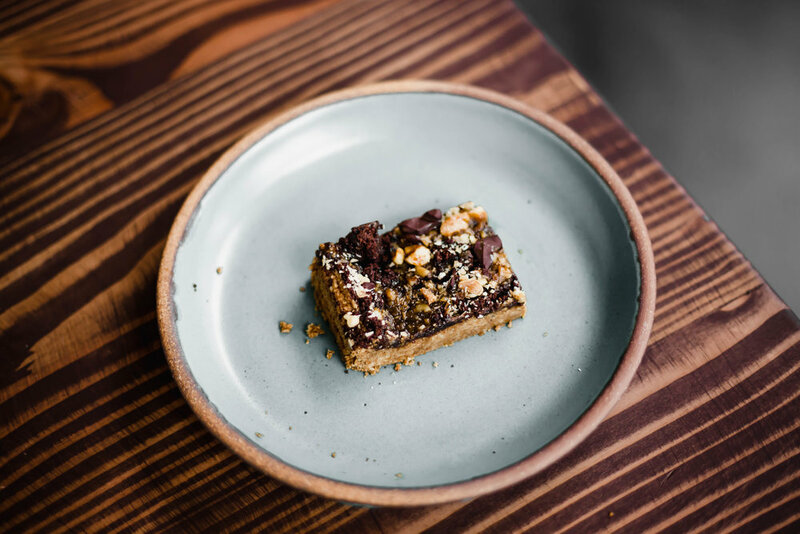 And finally, the last item we tried was the 7-layer bar, which brought an overwhelming sense of nostalgia into the air. When I was little, my mom would always make this dessert she would call a "dream bar", which was basically a concoction of chocolate, coconut, and condensed milk in one square-shaped bar. Yes, it was as delicious as it sounds, and it's one of the few non-vegan items that I do still miss. So when we saw these 7-layer bars, we both thought the same thing: vegan dream bars!! We knew we had to have one, and immediately dove into it, expecting the same chocolate and coconutty goodness. However, to our (slight) disappointment, these didn't taste anything like the dream bars we knew and loved. But that isn't to say that these were bad- I thought they were quite good, and I enjoyed them thoroughly! But they are definitely meant for a bit of a more refined palette. The bars are filled with an almond paste in the center, which held a striking resemblance to marzipan. And while I never truly cared for marzipan growing up, I really enjoyed it here. The mix of the almond and the chocolate was a great combination (seriously, who doesn't love almonds and chocolate?!) and was, again, just the perfect amount of sweetness for my liking. While the cake was probably my overall favorite item of the day, this bar was definitely the most crave-worthy. I'd be lying if I said I wasn't drooling over these photos as I write this post. Overall, Wholesome Bakery left me with a "whole" (ha) lot of mixed feelings. Would I go there again? Sure, if I was in the neighborhood (Lower Haight, to be exact). But would I go out of my way to cross the Bay Bridge just for a slice of cake? Probably not. While I found it to be good, I didn't think it lived up to all the hype it received, and personally, I didn't think their baked goods were the best I've ever had. But with that said, don't knock it 'till ya try it. If you happen to be in the area, I definitely think it's worth it to stop by and at least try it out! Split a treat with your hunny, or eat two by yourself- whatever makes you (and your tummy) happiest. ** This post was written in partnership with Wholesome Bakery. All opinions are my own. Thank you for supporting the sponsors that allow TRTH to continue existing!